Besides being a master baker and fantastic cook, Buddy Valastro is a great host. He knows the key to every successful family dinner, gathering, or party: a fabulous cake as the starring attraction together with great food! Clear, step-by-step instructions and photos will guide you through recipes perfect for all generations and for every occasion-birthday parties, anniversary parties, summer barbeques, and feasts for the major holidays. 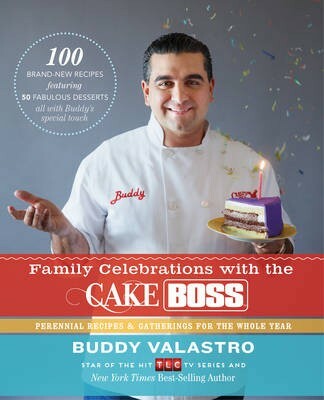 As he does in every book, Buddy brings his characteristic warmth and flair to Family Celebrations with the Cake Boss, sharing personal stories alongside cooking, baking, and decorating tips. His charisma as well as his delicious appetizers, dinners, and desserts make this an indispensable cookbook for every holiday and special occasion. Whether you're cooking for six or sixty, these delicious dishes from the Cake Boss will make your next family gathering an event to remember!